Savvy Spending: Bruegger's Bagels: 3 FREE Bagels with purchase on 1/31 for rewards members! Bruegger's Bagels: 3 FREE Bagels with purchase on 1/31 for rewards members! 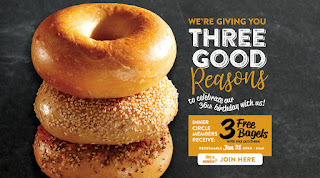 For their 36th birthday, Bruegger’s Bagels will be giving Inner Circle Members three free bagels with any purchase on January 31, 2019 from open until 11 a.m.